I pulled out the advent calendar I made 2 years ago. To make it, I decorated a big, sturdy poster board with Christmas paper (from Martha Stewart's discontinued Woodland designer paper- I got good use out of that stack! It's my favorite Christmas paper to date). I glued twine across the board. I used the twine to hold the mini paper bags. I folded those in half, decorated, and numbered them. Then I used paper clips to hold them in place. The first year we used it, I put little toys, candy, etc. from the 99¢ store or $1 bins. The following year (last year), I decorated project life cards and wrote festive activities to do together as a family on each card instead. I prefer the daily, fun activities. So far we've sat together, drank hot chocolate, had cookies under the twinkle lights with Christmas music. Yesterday we went to our city's tree lighting ceremony. We did a Christmas mad libs the other day. Fun, simple activities. 2. Probably along those lines, "Before you 'assume’, try this crazy method called 'asking. '” by Jelly Wong for Lifehack. 3. Sasha Brodeur shared her "Holiday Home Tour 2014" on her blog Lemonade Makin' Mama this week. Her minimalist style is beautiful. (I especially like her hot chocolate station). 4. 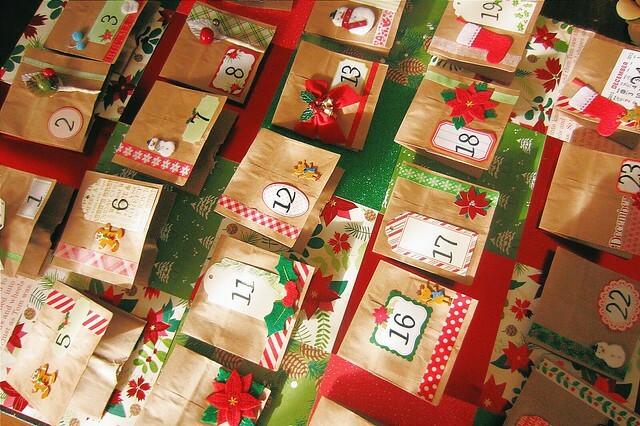 I'm following Nikki Mans' Crazy Crafty Christmas Countdown, a D.I.Y. project every day through Christmas Eve. Her "Happy Acorn Necklaces" are adorable. 5. Along with Ali Edwards, I am inspired by Kellie Winnell's, Kristin Tweedale's and Trisha Harrison's December Daily albums. (See mine right here).